W x D x H: 440 x 795 x 620mm. Choice of three colours. Health and safety should be at the centre of everything a business does to ensure their employees are protected against preventable accidents. 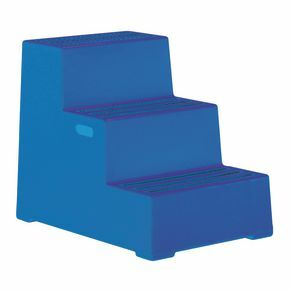 Our plastic safety steps will help to keep the users safe while using them to access hard to reach areas. They are light weight, medium density polyethylene moulded steps and they are fitted with slip resistant abrasive strips to aid safety. With a capacity of 260kg these heavy duty steps are ideal for any user and they can be used when manually moving heavier items. Waterproof and chemical resistant they are ideal for many industrial settings, as well as ideal for wash down applications. They comply with EN14183 2003E and are available in three colours; blue, red or yellow. Our plastic safety steps are a great way to help your employees easily access hard to reach areas and reduce the risk of accidents. They come with a 12 month guarantee and FREE UK Delivery.